You know you have a healthy soil but it isn’t growing healthy plants the way you expected it to do. There may be something wrong with the soil, which could be leaching essential nutrients. It’s time to learn more what is leaching in soil, how it happens and how you can possibly prevent it. ﻿What is Leaching in Soi﻿l﻿? 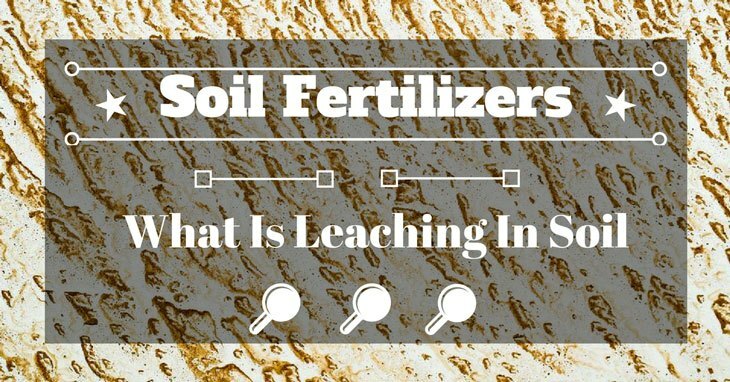 What is Leaching in Soil? In layman’s terms, leaching in soil means leaking of water down the soil. The soil is more like a sponge. When it rains, the top part of the soil absorbs as much water, keeping the moisture available for the plants. However, when the soil is filled with water more than it can hold, leaching occurs. When the water leaches downward, it takes down soluble nutrients, fertilizer components and other chemicals with it. If the soil is very porous, leaching is unavoidable. Generally, sand is the most porous medium, allowing the chemicals to easily pass through it. On the other hand, leaching is less of a problem for soil like clay. There are several factors that make the soil prone to leaching. One of them is the soil structure or type. For example, clay soil has a high water retention level while sandy soil holds less water. Another factor is the amount of water that the plants can absorb and use. Generally, plants with large leaf surfaces or those with glossy dark leaves absorb and use more water. Having these types of plants improves the ability of soil to hold more water before it leaches down. The amount of rainfall also affects the probability of leaching. Heavy rains put too much pressure on the top soil to absorb water. And when the soil reaches saturation and can no longer hold water, leaching will start. Other factors that promote leaching include high temperatures and the absence of protective vegetation. During the leaching period, the soil will lose valuable plant nutrients. Sometimes, leaching can even change the soil structure. Knowing this is important as you try to improve the health of your plants. According to Encyclopedia Britannica, in areas that experience extensive leaching, many of the important plant nutrients are lost. Leaching also leaves behind manganese, quartz, aluminum and hydroxides of iron, forming a type of soil called laterite. When the residual materials accumulate and are redeposited in the lower layer of the soil, they may coalesce and form tough and impermeable layers called duricrusts. Nitrogen is a common element that you can find in nature and it is essential for plant growth. During leaching in soil, this element is also the most affected. The earth’s atmosphere is composed of 78% nitrogen (N2). As it cycles through the air, soil and water, it undergoes different chemical and biological transformations. The plants require nitrogen to grow. These crops are then eaten by livestock which in turn produce manure. The manure contains nitrogen and works as an organic fertilizer for the plants. To increase plant growth, many farmers use fertilizers like nitrate (NO3) as well as ammonium (NH4) which are commonly applied on the root zone of the plant. The sad part is that the soil cannot absorb excess NO3 ions. The excess NO3 then moves downward with drainage water and then eventually leaches into groundwater and even to large bodies of water. This in turn affects the oxygen levels in the aquatic systems, leading to adverse environmental impact such as fish kill and health issues for humans. Furthermore, the toxic chemicals and pesticides used by farmers also reach the water table and contaminate the natural source of water under the earth. Additionally, as the chemicals drain down, they typically leave a crust of soluble salts on the soil surface. With the crust, it will be difficult for the soil to absorb water for the plants. This is one of the reasons why using an organic fertilizer and pesticide is more advantageous. Gardeners normally try to remove the salts by pouring more water until the white covering on the soil is no longer visible. There is no easy way to prevent leaching in soil. However, you can reduce its impact if you know the level of soil tension (how the soil holds on to the water) and how much water the soil is already holding. Some farmers have a device that measures real-time soil tension and notifies when the tension reaches the saturation level. The farmers can then take precautionary measures to protect their crops. However, without this device, it’s hard to determine when leaching could occur. 1. Apply fertilizers especially nitrogen in small applications rather than everything at once. 2. After clearing your garden in preparation for the next planting season, cover bare soil to prevent leaching during rainy days. This also applies to prevent leaching out nutrients during winter rain. 3. When preparing compost for your potting mix, include slow for a more steady plant growth. 4. During winter, mulch with impermeable plastic to prevent leaching in soil. Leaching in soil can affect your crops because it takes away the essential nutrients that the plants need to grow. But more importantly, leaching has a profound effect on the whole environment. If possible, avoid using harmful chemicals to boost your harvest. Every single drop of chemical that will leach to the ground and bodies of water can affect the environment. Did you find this article helpful? Please share with us your thought through our comment section. Please feel free to also share this article to your fellow gardeners.